The global baby personal care market is currently valued at around USD 56 billion and is expected to grow at an annual rate of approximately 7% from 2016 to 2024. Increased awareness among consumers regarding child hygiene is a primary factor driving the increase in the baby personal care market. The baby personal care market includes product types such as cosmetics, toiletries, and other products. The baby care market ranges all the way from products for newborns to those aimed at children under 11 years old. Cosmetics are defined as baby skin products, hair care products, oral care, and bath care products. Toiletries are made up of products such as disposable diapers, fragrances, training pants (pull-ups), and baby wipes. Other products include organic baby care products, baby grooming products, and baby personal care sets & kits. Currently, Europe, North America, and the Middle East account for a significant share of the baby personal care market. Older, wealthier moms and an increased number of women in the workforce has led to increased disposable income which has affected the purchasing power of the family; this factor is expected to increase the demand for baby personal care products across the world. Baby care products are predominantly driven by trust rather than innovation. This anomaly leads to an increase in demand for organic and natural products and a tremendous surge in “free from” claims in baby care products. Parents increasingly demand to know what ingredients are NOT in a product, even if that seems counterintuitive. Fragrance in baby care products plays a vital role in engaging young consumers. While traditional scents like chamomile and lavender may appeal to parents, older children prefer updated, modern fragrances like citrus and mint to differentiate tween products from baby products. Caution: Use only as directed. Excessive use or prolonged exposure may irritate skin and urinary tract. Discontinue use if rash, redness, or itching occurs. Consult your physician if irritation persists. Keep out of reach of children. Another often overlooked issue is cosmetic products that may be choking hazards. When marketing to children under the age of 3, it is crucial to be aware of any components that could become caught in a child’s throat. 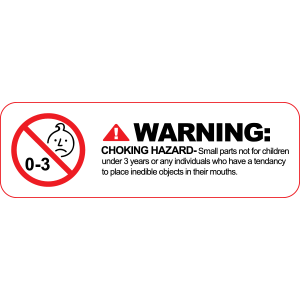 If you are unsure if a ball, small toy, cap closure or another component for your baby product is a choking hazard, you can purchase a small device called a “choke tube” or “small products tester” (created by the CSPC). If a small part fits entirely into the cylinder, and the toy or product from which it came is intended for use by children under the age of 3, the toy or product is banned because the small part presents a choking hazard. Toys that are or contain small pieces as manufactured and that are intended for use by children from 3 to 6 years old must be labeled to warn purchasers not to buy them for children under three years old because those children could choke on the small parts. While the market for baby personal care products is growing, it is critical that you familiarize yourself with all of the rules, regulations, and requirements for marketing this class of product. Safety is crucial for this subset of the cosmetics market.